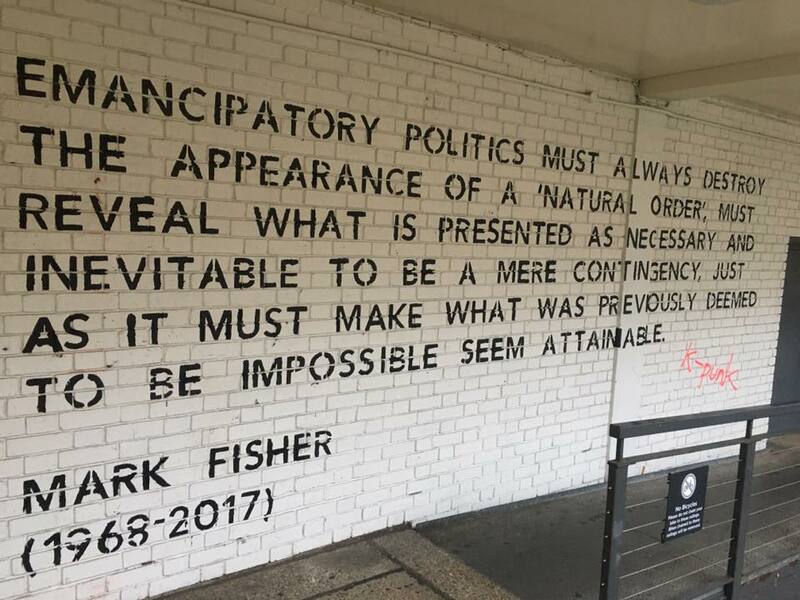 Two years ago this month we lost Mark Fisher, but his vision of a socialist future endures. At the heart of the work of Mark Fisher is something he called ‘popular modernism’. By this he meant a kind of culture – most often found in music – which straddled the experimental and the mainstream. While popular, it required work to be fully understood, doing away with past forms, following a modernist make it new imperative. As an idea, it was based on the claim that the most interesting post-war culture had developed out of a flourishing welfare state, made by the students of municipal art schools and the recipients of higher education grants. Pop modernism, he argued, embodied a sense of possibility which never fully recovered from the thoroughgoing attack it underwent in the 1980s. However, Fisher was by no means deaf to contemporary pop music: he went from praising the ‘sadness’ and ‘ambivalence’ of early Rihanna to the ‘existentialism’ of Dido. While he found a natural habitat in polemic, his primary work was a matter of fleshing out alternative realities, breathing form into the lost futures by which our present is haunted. A new 800-page volume, K-PUNK, from Repeater, the publisher Fisher set up with Tariq Goddard after leaving Zer0 books, collects unpublished writings, interviews and blogs from 2004 to 2016, and attempts to set in order the thinking of a figure whose death in January of 2017 was a great loss to British intellectual life. Fisher’s philosophy of “going beyond the pleasure principle” underpins this writing. As he argued in his widely-loved short book Capitalist Realism, we are trapped in a state of “depressive hedonia”: not “an inability to get pleasure” but “an inability to do anything else except pursue pleasure”. The work in the anthology explores this through a wealth of genres, artforms and ways of life – hip hop, indie, neo-noir – in a style that mashes together a lay criticality with an eclectic array of philosophical reference points. Fisher insisted that theory should be used in the analysis of everyday life, to intensify it, and his work is underwritten by a quite moving sense of the freedom gained through mastering these methods of analysis. He was exposed to this culture by the music journalism of the 1980s: “No sob stories,” he wrote, “but for someone of my background it’s difficult to see where else that interest would have come from.” His writing has the feeling of a system – an entire architecture – coming into being, each post an opportunity to finetune its pillars and boundaries. Fisher’s emphasis on the everyday places him in the vein of the Birmingham school and the tradition of cultural studies, of Richard Hoggart and Stuart Hall, who were, in the 60s, 70s and 80s navigating a path between the machine of High Theory and the real feelings and events it claimed to talk about. Like them, Fisher understood that it wasn’t just protest songs that contained political content. But Fisher, for his part, railed against academia and the stolid manner of interrogation to which it too often gave rise, and expressed his frustration with academic leftism and its dogmatic adherence to a quasi-Marxist ‘theology’. Blogging became a kind of respite from this fustiness. In 1999, Fisher had completed a doctorate in Philosophy at the University of Warwick. Starting the blog five years later and announcing himself as k-punk, he described his relationship to the academy as, “uh difficult”. “PhD work bullies one into the idea that you can’t say anything about any subject until you’ve read every possible authority on it… Blogging was a way of tricking myself back into doing serious writing,” he said in an interview with Rowan Wilson in 2010. k-punk also, of course, nurtured its own community, becoming a hub of online interconnection in a spirit of techno-idealism still viable in the early 2000s. The new volume contains a previously unpublished introduction to a book Fisher had been working on called Acid Communism. Disturbed by the cruelties of the unfolding conjuncture – Brexit, Trump, the bitter nature of online interaction – Fisher was looking for new ways to connect, and unexpectedly chose the averted utopianism of the psychedelic counterculture of the 1960s as a locus for revival. He hoped we could find in this a kind of consciousness capable of overcoming the legacies not only of neoliberalism, but of an ‘authoritarian leftism’ that had neutered these experiments in the 70s. Fisher looks to Stuart Hall and the New Left as forerunners in this project: “The socialism that Hall wanted – a socialism that could engage with the yearnings and dreamings that he heard in Miles Davis’ music – was yet to be created, and its arrival was obstructed as much by figures from the left as from the right,” Fisher writes. The aim was to imagine new ways of getting through to one another. “We on the left have had it wrong for a while,” he writes: it is not that we are anti-capitalist, but that capitalism is anti-us. It is only by “unforgetting” our collective capacity to produce, care and enjoy, that we will overcome it. K-Punk: The Collected and Unpublished Writings of Mark Fisher 2004–2016 is now available from Repeater Books. Phoebe Braithwaite is a PhD student at Harvard University working on Stuart Hall and British Cultural Studies. She previously worked for Wired UK, and was an editorial assistant for Open Democracy.